Illuminated manuscripts are unique, handwritten manuscripts, embellished with splendid drawings created by expert Renaissance illustrators in gold, silver and other colours. Today, the original manuscripts are kept at important museums and world heritage libraries and are only available to the public in the form of facsimiles. 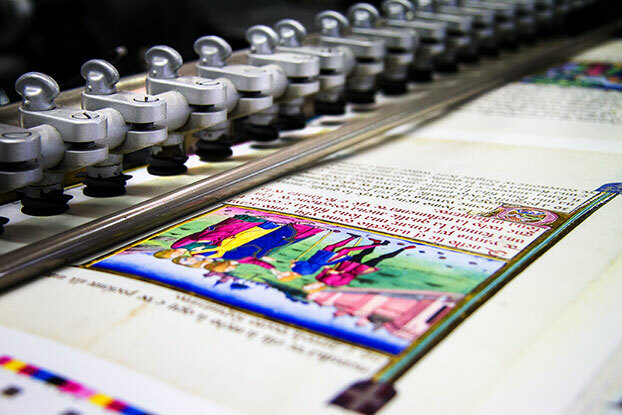 We are specialised in the reproduction of historical volumes and illuminated manuscripts, having gained important know-how in the sphere of high-quality printing over the years. 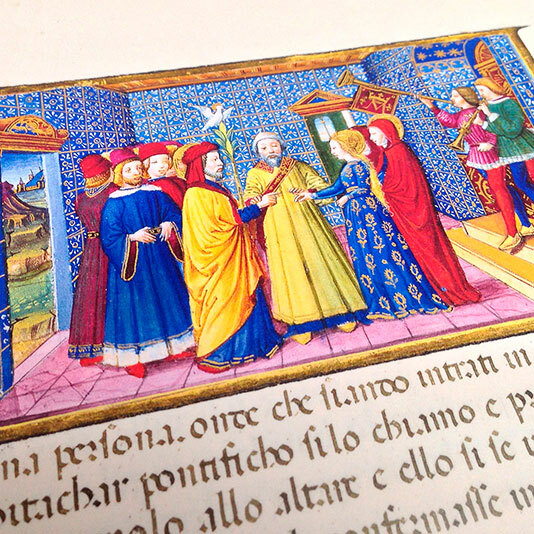 Printing a facsimile does not mean simply creating a high-class print. It means reproducing the brightness and brilliance of the "lapis lazuli blue" in the original. 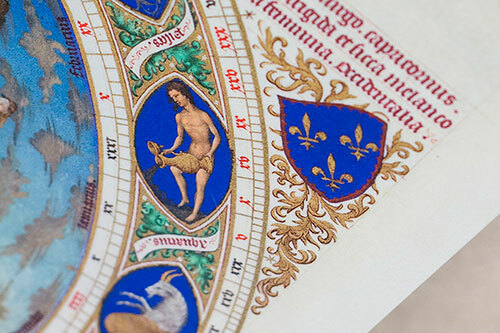 It means creating the correct level of embossing for the gold foil, replicating the various page profiles, ensuring the paper feels like real vellum and printing at a resolution of 2400 dpi to allow the reader to study the work with a magnifying glass and enjoy even the tiniest details that were typical of Renaissance illustrations. With this work cycle and using 4 colours only, we can achieve the same results as hexachrome printing: bright colours, sharp images and a startling three-dimensional effect. The various sheets can be punch cut individually to recreate irregular edges and tiny flaws. 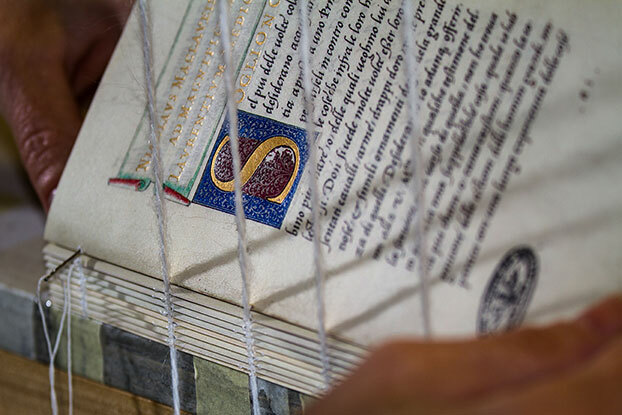 Just as in bygone times, the books are hand-bound by skilled craftsmen. Our box set cases are real gems. They are made of wood and then covered with fabric or animal skin and embellished with precious decorations. Naturally, the cases are all handcrafted. This is a new technique that allows certain areas of the print to be gloss-finished by depositing metal microparticles on it. This technique is particularly suited to creating overprints with 4 base colours, pantone shades or metallic inks. The end effect simulates the powdered gold that was once deposited using bronzing machines. This is a technique that not only transfers gold foil to a printed sheet without using clichés, but also makes it possible to create the same embossed effect on both sides of the sheet without using the mechanical process that would ruin the effect on the other side. 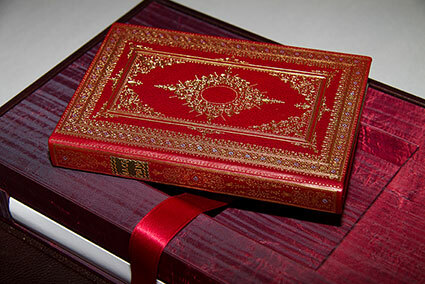 The level of embossing can also be adjusted to achieve an almost entirely flat or fully embossed effect. Today, the technique of paper aging has been refined to the point where it can be used at a semi-industrial level. 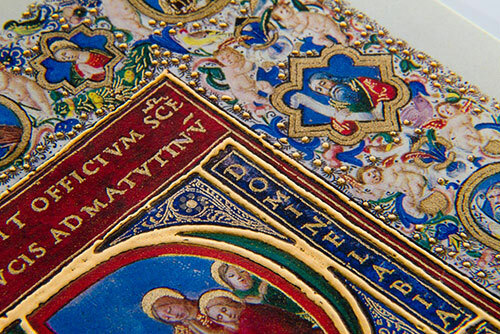 And our R&D team has taken it one step further and applied it to the reproduction of illuminated manuscripts that need to be as faithful to the original as possible. 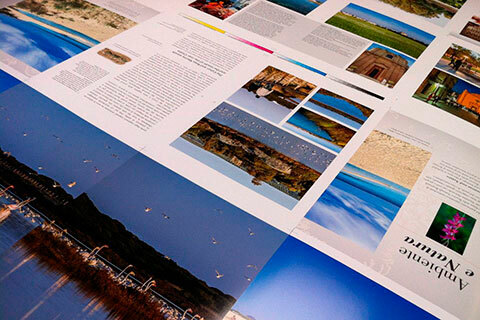 This depends, not only on advanced print techniques and embellishments, but also on how the paper is treated during post-production. 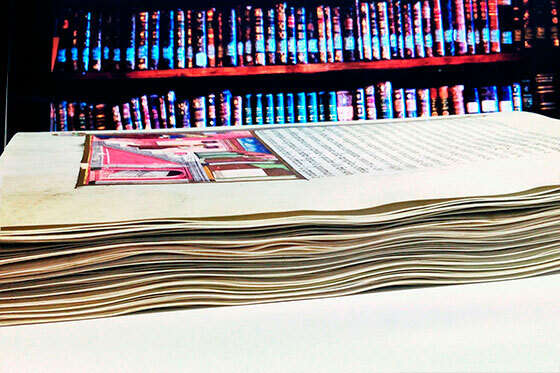 Today, we can age a volume by using a complex process that treats each printed page individually, recreating the wrinkled effect caused by dampness and the feel of real vellum that is completely different and cannot be compared to other vellum paper currently available on the market. We can even reproduce the differences in the two sides of the paper by making the outside smoother and the inside rougher.